William Blake knew he was in trouble when he saw the zebra unraveling like a ball of twine, especially since there shouldn’t be any free roaming zebras in the high desert southeast of Boise. “Get a grip, get a grip, get a grip,” he muttered to himself, pressing his hands on each side of his head. The vision wouldn’t go away, but neither did the zebra seem to mind its condition. The zebra moved on but then the clouds started turning themselves inside out, swirling and shifting from white to silver, then to magenta and turquoise. The grass around his ankles and then all across the field. writhed like serpents and rubbed against his legs like affectionate house cats, while the trees in the distance grew and expanded to Pellucidar-like proportions. Then the sky became granite and the ground turned to vapor, but neither did the atmosphere collapse upon him, nor did he fall through the mist. After that, the world became itself again except that the zebra was still there, and it was facing the sweating trembling man. Shifting his weight from one leg to the other attempting to keep himself from collapsing, he could hear the cheatgrass crackle under his shoes, feel the longer strands tugging at his blue jeans, and suffered the sweat drenching his chest, causing his plain t-shirt under his pullover sweater to cling to his skin. “Yes, William. All zebra’s can talk.” Then she giggled like a teenager, reminding him of his daughter Edna when she was younger. “Kid…kidding. Yeah. What a laugh.” Blake’s chest was constricting and he was worried he was going to have a heart attack. “Five. Yeah. I remember being five.” His words came out breathless as if he had just finished a 10K run. “Wait. The zebras, the sky, the birds. When I was a kid, I saw…I dreamed…” He risked a look upward and witnessed what he expected but at the same time hoped he wouldn’t see. A flock of enormous Rocs were soaring overhead, making for the southwest. One looked like it had a small calf in its talons. “What happens when you wake up?” He regretted the question the minute it left his lips. “Then nothing is real.” He felt himself become light headed and was sure he was about to pass out. Then the zebra rushed forward and nipped his shoulder. “But…but…” He found himself proverbially rooted to the spot. William looked around again, felt the warm breeze from the gentle exhalations of the dragon sleeping just a few hundred meters to the west, saw a herd of Banthas grazing on the African savannah to the south, just as Buck Rogers’s spaceship rocketed high overhead and out of sight, heading for a new adventure. He was amazed that he was actually calming down, despite the fantastic scenery surrounding him. “Dreamer.” She was sounding more like an adult woman rather than a fifteen-year-old girl. “Now turn around.” Dreamer made a circling motion with her zebra head as her rear section rewound itself to look like a normal animal’s hind end. 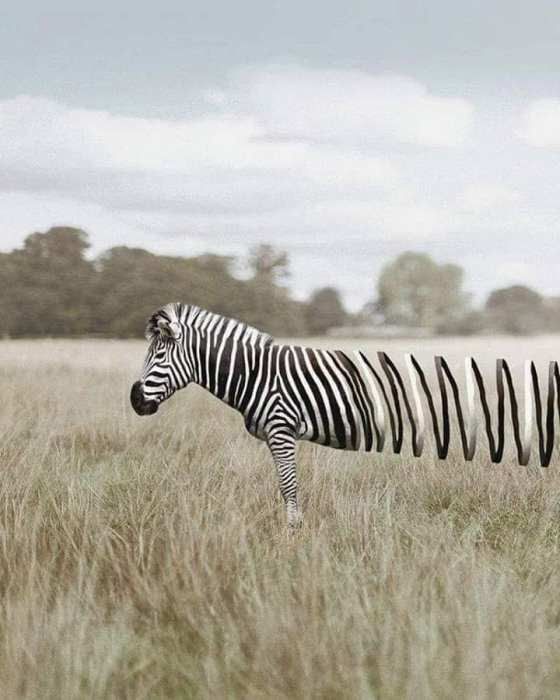 By the time William had turned back toward the dirt road where he parked his Subaru, everything appeared as it was before he’d seen the zebra. The sky was its usual blue and dotted with gray and white clouds, the tall grass was a golden tan, its greenery hibernating for the winter, and the breeze made the chilly 22 degrees F feel a lot colder. “So, it’s all a dream is it? I’m just a dream?” He muttered to himself as he started walking, and true to her word, as he approached his car, William began forgetting, but not completely. Later that night, he was going to have a very interesting conversation over a few beers (though the zebra would take hers in a bucket) on his back patio. I wrote this for Photo Challenge #245 hosted at Mindlovemisery’s Menagerie. The idea is to use the image above as the prompt for crafting a poem, short story, or some other creative work. The images posted by Nekneeraj are almost always surreal, allowing me to author some interesting stories, but this one was a challenge. I was writing without having a clear ending in mind, but finally settled on what you just read. It’s been hypothesized that the universe is a simulation, but if that’s true, then who created it? What if, as the ancient Chinese philosopher Zhuang Zhou suggested, existence is just a dream? Oh, a Roc is a mythological bird and a Bantha is a creature from the Star Wars universe. Pellucidar is a series of novels written by Edgar Rice Burroughs about a prehistoric world hidden inside a hollow Earth. Excellent imagination — as always. Quite a beginning for this brand new year. Thanks, Sandra. Happy New Year to you and yours. Good thing the Zebra (aka Traveler) is really “imagination”… otherwise he’d be in trouble for serving alcohol to a minor. Here I was thinking the guy was on acid, but then I realize that the Matrix has him. Yes, I would say that’s a fun start to the year. I loved this song of innocence and experience. Surely the name of the main character is no accident? Perhaps a Tyger (Tyger tyger burning bright) will come for a beer, too.